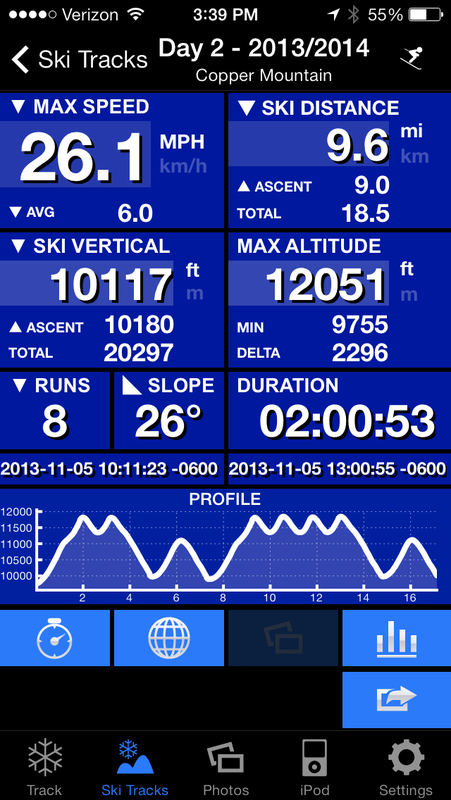 First Ski Day Winter 2013-2014. | John's Space ….. I skied 3 runs (4 the way I count, i.e. any full length of chairlift passed equals one run) and took a snack/warmup break. After that I skied 5 (6) more runs and called it a day. After all, it’s first day and I just want to ease into it. I did have my trusty Ski Tracks app turned on for all those vital skiing statistics that a modern-day tech person can’t do without. The stats this app tracks never cease to amaze me. The screenshot at left is at the end of the day. It says Day 2 because I used it for bicycling in October so it thinks it’s my 2nd day skiing. No prob. It is in Pause, such as I do to stop recording during lunch. You can hit Resume if you continue skiing or Save to save the day’s data to the app. Note the Altitude shows current altitude and the Min and Max altitudes during the day. The shot below reflects the Save one second later. The altitude now shows Max altitude achieved, Min, and Delta, the difference between the two. Click a picture to open full size. 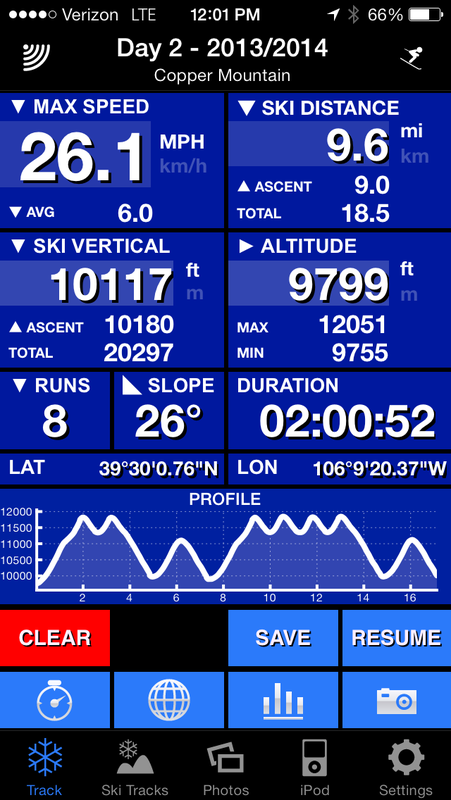 Data by mile (up chairlift and down hill). Data available by hour. Even more data can be seen by clicking an item. What is REALLY cool is opening the data in Google Earth and viewing a tracking video of your ski day. Following is a video recording of the video. Apologies for lack of sharp focus. Photography 101 includes movie making. Here are some Pre-Ski Season Ski exercises just for you…..
1) Visit your local butcher and pay $30 to sit in the walk-in freeze for a half an hour. Afterwards, burn two $50 dollar bills to warm up. 2) Soak your gloves and store them in the freezer after every use. 3) Fasten a small, wide rubber band around the top half of your head before you go to bed each night. 4) If you wear glasses, begin wearing them with glue smeared on the lenses. 5) Throw away a hundred-dollar bill now. 6) Find the nearest ice rink and walk across the ice 20 times in your ski boots carrying two pairs of skis, accessory bag and poles. Pretend you are looking for your car. Sporadically drop things. 7) Place a small but angular pebble in your shoes, line them with crushed ice, and then tighten a C-clamp around your toes. 8) Buy a new pair of gloves and immediately throw one away. 9) Secure one of your ankles to a bedpost and ask a friend to run into you at high speed. 10) Go to McDonald’s and insist on paying $13.50 for a hamburger. Be sure you are in the longest line. 11) Clip a lift ticket to the zipper of your jacket and ride a motorcycle fast enough to make the ticket lacerate your face. 12) Drive slowly for five hours- anywhere- as long as it’s in a snowstorm and you’re following an 18-wheeler. 13) Fill a blender with ice, hit the pulse button and let the spray blast your face. Leave the ice on your face until it melts. Let it drip into your clothes. 14) Dress up in as many clothes as you can and then proceed to take them off because you have to go to the bathroom. 15) Slam your thumb in a car door. Don’t go see a doctor. 16) Repeat all of the above every Saturday and Sunday until it’s time for the real thing! We do exercises for winter too. 1. Stick head in freezer for 5 seconds to remind us why we are HERE IN TEXAS. 3. Put our BBQ cover on ebay since we grill all winter. 4. Watch reruns of winter Olympics since we rarely see snow. 6. Wear a jacket a couple days and wipe it off in case we need it and get used to the extra weight. Gallery | This entry was posted in Copper Mountain, Recreation, Skiing, Skiing, Sports and tagged Colorado, Copper Mountain, Ski, Ski season, Skiing, Snow, Winter sport. Bookmark the permalink. 8 Responses to First Ski Day Winter 2013-2014. Ha! Thank you. It IS early but summer and autumn are definitely gone in the mountains. I was back on the slopes next season. Thank you. 13″ of new snow in the last 48 hours at Copper. A few more runs are open. Should be good for a few more turns.